Patricia Reid-Merritt is Distinguished Professor of Social Work and Africana Studies at Stockton University, in Galloway, New Jersey. Reid-Merritt, Patricia, editor. 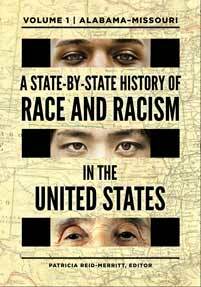 A State-by-State History of Race and Racism in the United States [2 volumes]. Greenwood, 2018. ABC-CLIO, publisher.abc-clio.com/9781440856013. Providing chronologies of important events, historical narratives from the first settlement to the present, and biographies of major figures, this work offers readers an unseen look at the history of racism from the perspective of individual states.